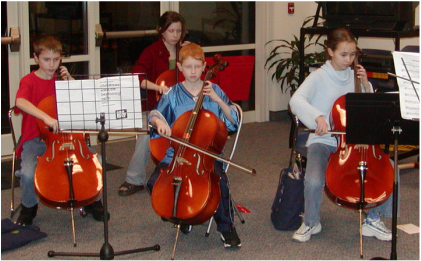 Interested in scheduling a group lesson in violin or cello? Group lessons are lots of fun. Our younger students love group classes: being with and making friends other kids having similar interests. Many very young beginning violin or cello students (4-years old and up) start with weekly small group lessons. Parents new to being "violin, cello families" appreciate the interaction with other moms and dads also new to this role. Students continue taking these lessons in small groups as long as they all progress at a similar rate. This might last one term or for a couple years. When their skill levels indicate, they move into weekly individual lessons. We schedule group class times before the beginning of the school year, usually just after our Summer Workshops, by talking to interested families to find the most agreeable time. Classes generally happen in the early evening for working parents. We ask parents to attend these classes with their students to learn about each week’s lesson and how they can assist their children with practice at home. and all your family visit our School!